I’d been writing this blog – for fun, unpaid, with no silly notion of ever becoming a Real Writer – for five and a half years, when, out of the blue, at the end of November 2017, an offer of an ongoing freelance writing job popped into my inbox. Within days, I had decided not only to take it, but to divert from my planned route of returning to teaching (the career I enjoyed pre-children) and push some Writing doors instead, to see whether they opened. This began in earnest at the start of 2018. I shared my dream with you, followed by some updates one month in and a few months later. I’ll be completely honest here: I’ve never ‘chased a dream’ before. I’m quite a play-it-safe person. When I was working, it was for someone else. I did the work, the payslip arrived. I’ve always taken predictable, well-trodden paths – so all the super-motivational memes kind of scared me a little. And yet, one year in to stepping out into the unknown, I’m finding myself rather enjoying the surprises! Here are some character traits that I’ve had to exercise, develop or dust off over the past twelve months. No-one – not even my husband – will bat an eyelid if I have a day off. But I know I can’t afford to waste any of the small amount of child-free hours I have for this dream. I’ve had to push myself in order to get things happening. I have been working on two book submissions (one for kids, one for adults), writing regularly for Home for Good, submitting pieces for magazines and websites, and attempting to blog regularly right here at Desertmum. I’ve also grown my email list from scratch, write weekly emails to my subscribers, and wrote my first ebook (15 Spiritual Practices Every Tired Parent Needs To Know – get yours here)! While I’m eternally grateful to the many friends who ask how things are going, and hold me accountable, if I’d relied merely on the prompts of others I’d not have managed anywhere near all that. Self-motivation is vital if you’re pursuing your dream. I also learnt how to use MailChimp for my email subscriber list (what? You’re not on it??? Rectify that right now! ), did several courses in varied aspects of blogging, learnt about affiliate links (and became an Ultimate Bundles affiliate), got to grips with Canva (an online editing tool which I use for the graphics you see on this blog), started using Tailwind to encourage traffic from Pinterest, networked with lots of writers, went on a Writers’ Day, and overall learnt a huge amount generally about the writing and blogging industries. You may think I just sit around all day and write. While the sitting around bit is correct (hello Sofa and Blanket), there’s a lot more to writing than just writing. Maintaining a website, getting yourself trained up (because you don’t have a line manager to send you on training), networking, communicating – this all takes time too. There are other things I’ve learnt too. The style and expectations of various organisations. The fact that nothing is definite until you’ve signed that contract. The cost of illustration, and what a huge difference it makes to the budget of a small publisher or first-time author. The impossibly-high commission that Amazon takes, and what a huge difference it makes to the budget of a small publisher or first-time author. How we must support authors as much as possible by buying as many of their books as we have friends to give them to. What it feels like to have an editor ruthlessly slice up every single phrase you’ve carefully constructed. In short, if you’re not willing to learn new things, don’t even think about pursuing your dream! 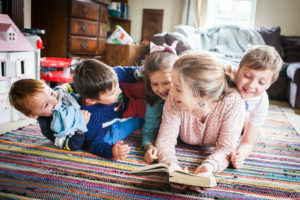 I’ve had to discover more productivity tools, such as getting the family more involved in tidying up, developing short, regular routines so that various jobs don’t build up to something unmanageable, and using every tiny scrap of child-free time I possibly can to write or develop my writing. My current schedule is based around when my twins are at nursery and I don’t have other commitments – so, Mondays all day and Tuesday afternoons. It’s not much, so I usually top up with a couple of evenings too. But on Tuesday and Wednesday mornings, when I have other commitments (Suzuki Early Years classes, and Parents’ Bible Study respectively), I actually have between 30 and 60 minutes of childfree time before these things start. It might be tempting to come home from the school run and do my hair or make-up, or check social media – but, actually, I know that I need to use these times for work – either writing, or the various admin tasks I’ve alluded to. In order to do this, I need to get myself ready and organised before my kids leave for school. This is regular, day-to-day stuff for many of you, but forgive me: I’m just learning now! (And I’m so not a morning person, so this is a challenge!) My motivation is that I love to write, and would much rather spend my free minutes writing than tidying away breakfast or cleaning my teeth. Come September, all four of my kids will be in full-time school, so my pattern will change again and allow plenty more time for writing – but, at the moment, I’m trying to focus on the here-and-now, enjoying this very special stage of being at home with my boys, and making the absolute most of the time they’re in nursery. Productivity, especially if you’re juggling your dream with kids, elderly relatives, a paid job or other commitments, is an absolute must! Rejection emails come with the territory when you’re a writer – and, in their own way, I guess they come with pretty much any dream. The potential client who walks away, the magazine who won’t feature your business, the customer who complains. I’ve had rejection emails, and also a fairly major disappointment regarding my children’s book. The publisher with whom I’d been in contact with for the best part of a year pulled the plug on our project. Gutting. And yet, in many ways, it was a blessing. This publisher hadn’t communicated very well, nor done the sums, and I’m not sure they were very passionate about the book. It meant I resumed my search for a publisher with eyes wide open and a more critical perspective. I could have sat around and moped for weeks, even months, but resilience made me get straight back onto my list of publishers, going through each one’s submission guidelines, checking which of them would accept unsolicited children’s manuscripts, and sending off proposals to as many as would accept them. I think I was up till 1.30am one night doing this, but I was desperate to get on with it and wasn’t sure when I’d next have the time. Within a week it had paid off: I had another publisher show interest in my book, and two additional publishers keen to hear more. I’m hoping that, one way or another, this book will be released this year – it’s something I feel is really lacking in children’s literature. I can’t wait to share more details with you! In the years when I was raising my kids at home without paid work, imagining what I might do once they all started school, I had dreams of setting up my own business. I won’t bore you with the long list of potential business ideas – suffice to say that, despite being quite a ‘safe’ personality, I’ve always had a desire to do something a bit entrepreneurial. When I started to pursue writing, I didn’t think of it as a business – but, actually, it is! I have income and expenditure. I have a vision for growth. There are several different aspects to what I do (blogging, freelance writing, and book authoring), but they tie together under the label of ‘business’. In the last couple of weeks I’ve been looking at the money I made last year, and planning what I’d like to make this year. This makes me sound terribly like an Apprentice candidate, but I think there’s a danger that us ‘creatives’ can spend so much time dreaming and imagining, that we forget to make a plan for putting food on the table. I’m not out to make big bucks – my dream is a very modest one, that I want to be earning a part-time salary by 2021/2022. Time will tell whether this is realistic or not! But any dream like this needs to be firmly rooted in reality. For example, I had in my mind a figure of what would be a good income for 2019. But then I did the maths and found that I didn’t actually have enough work to make that amount! So I went through all the possibilities for this year, adding in a couple of things, and setting higher targets for others, until my goal was reached. Of course, all this income is predicted, not actual, and there are many variables, but knowing that these variables can go either way makes me confident that, on average, this pipe dream could actually work out! This ties in a little with being business-minded about your dream. I’ve realised the importance of not only knowing what you want to achieve this year (and the steps you need to take to get there) but of having vague ideas for further ahead too. In the writing profession, you’re constantly thinking ahead. You’re writing a Christmas piece in April. You’re drafting an article which won’t make it to an audience for a good couple of months. You’re sketching ideas for a book which may not be released for two years. If you’re only considering what work is currently taking your time, then you run the risk of having no future work coming in. For example, I’m hoping to publish two books this year (the kids’ book, already mentioned, and a book for adults). I expect a good chunk of my time this year to be taken up with edits, communication, proof-checking, marketing and selling. But I also have an idea for my next book, and if I don’t make a start on that this year, then I may find that next year I have little income, because I didn’t set up projects this year that I needed to be completing next year. In other words, I’m thinking about Book Three before Book One is out! Pursuing a dream like this involves thinking ahead All.The.Time. What do you have planned for this blog in 2019? This post has already been too long! I hope to share some of my plans and ideas with my subscribers in this Friday’s email. Don’t receive my emails? Sign up here! It’s THE BEST WAY to make sure you never miss a blog post – emails are sent just once a week, with a summary of what I’ve written, plus other tidbits, and if you’re not interested in that week’s offering you can just delete the email and get on with your life. And you receive my free ebook when you sign up! I look forward to sharing more with you this Friday! 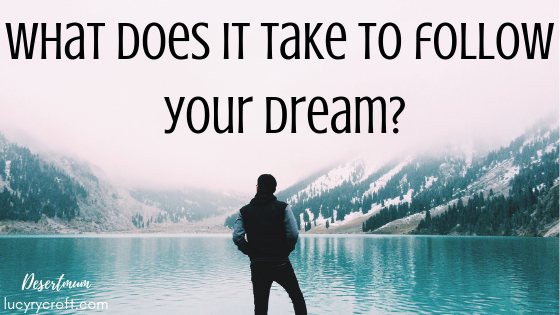 Over to you: are you pursuing a dream right now? Or have you done in the past? It could be a business venture, a voluntary project, a dream to stay at home with your kids, a new hobby… Do share! Thanks, Lucy. Great stuff. Reminded me of the song “Climb every mountain”! We do admire your persistence, and positive attitude. I am sure all new writers go through endless rejections. We have to be very thick-skinned. We really are proud of you, and look forward to your future writings. You are a great wife, a great Mum, and a great person. Keep trusting in the Lord – and don’t forget to clean your teeth!